Therapeutic laughter isn’t well researched, but a few recent studies show what chuckle fans everywhere suspect: laughter does you good. Researchers at the University of Oxford in the U.K. found that 15 minutes of watching comedy with others can increase pain thresholds by 10% – possibly through stress-relieving endorphins triggered by abdominal contractions. Other preliminary studies have linked mirthful laughter to enhanced memory, reduced levels of stress hormones, improved blood flow and even, to a small degree, an increase in the number of calories we burn. Sadly, as we hit our working years our tendency to laugh drops away – in one study, 30% of children observed in public settings made merry, compared to only 17% of those between 31 and 60. Be social: Laughter is contagious and we laugh 30 times more when we’re around others. Look for the funny: What hits your funny bone? Which friends crack you up? Keep track of these things and seek them out when you haven’t laughed in a while. Fake it to make it: Tests by the Laughter Research Network in Spain (OrganizaciÓn Mundial de la Risa) show that laughter may not need to be real to be beneficial. 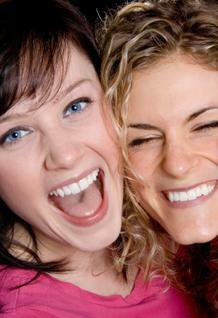 The popularity of laughter clubs and laughter yoga is proof that forcing a laugh can lead to genuine hilarity.